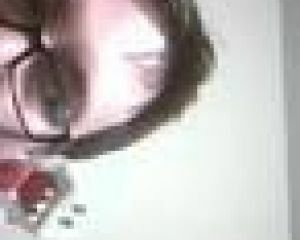 I've found some neat horror games while talking to other fans of the genre. 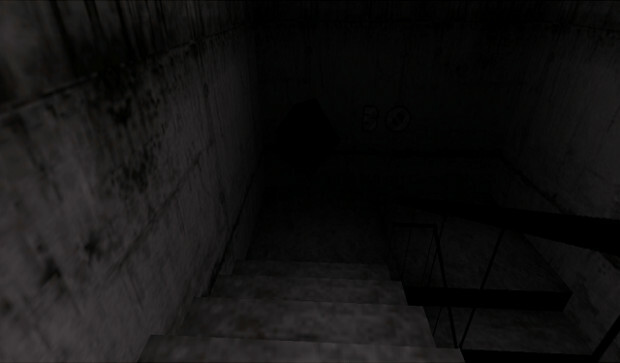 One of the more intriguing ones was a game that was simply called SCP-087, or sometimes The Stairwell. The name alone seemed cold yet evocative. What did it stand for? As it would turn out, it stood for the perfect distillation of everything that evoked fear; the 40-year-old Dalmore when you were used to drinking mouthwash and vanilla extract under an old bridge. SCP-087 gets right to the point, dropping you a short distance from a creepy old house. With some fiddling around in the foyer, you’ll open a door down to a stairwell that seems to go on forever. The furthest I’ve gone down it was 82 floors, but there are reports of people who’ve gone down almost 300 flights. 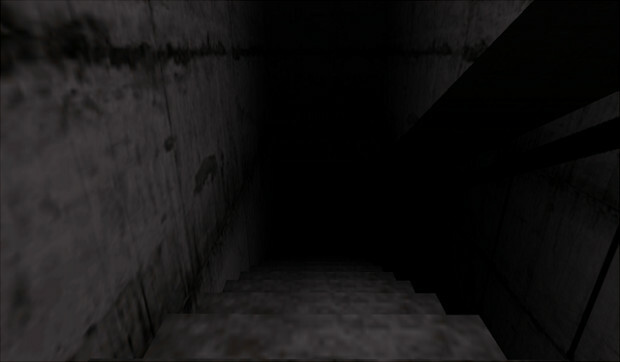 The point of the stairwell is that you’re trying to examine a creature that lives at the bottom of it, even though running into it is probably the last thing that will ever happen to you. This game is unrelenting in frightening you. Once you’re on the stairs, there’s nothing you can do besides walk closer and closer to a creature that is practically guaranteed to kill you. The floor it appears on is somewhat randomized too, so you can never be sure when the thing is going to show up. That information alone made my journey down the stairs into the most terrifying experience I’ve ever had with a game and quite possibly in my life. I had an archive of what happened during the three runs I made at this game, but have scrapped them so as not to spoil this for anyone. If you do want to play it, I suggest you don’t read anything else on it beyond this article, and especially don’t watch any videos. You only get one run at playing this game as intended, and you don’t want it ruined for you forever. Seriously, go into this game as blind as you can. Once you’re on the stairs, you’ll immediately notice just how dark it is. You have a limited light that won’t even reach all the way down the stairwell you’re on, which has the nice effect of always keeping you wondering what you’re walking into. There isn’t a whole lot happening on each stairwell, but sometimes you’ll catch sight of something strange on the wall or floor that will bring you to a complete halt. Just having that little something creep into your field of vision is really jarring when you’re not sure what it is you’re looking for in the dark. The smallest change in the normal environment is enough to give you the shakes. It happens because, realistically, you don’t know what it is you’re looking for when you play SCP-087. The game’s name doesn’t evoke any familiarity and doesn’t call up any meaning you might understand. The only screenshot that I saw before playing it was a pair of eyes floating in the dark. I had no idea how they would appear, or if there would be any warning at all. Every single time something in my environment changed, I thought it was time to run for my life. Each time I tensed up, it was hard to come down from it. There is a pause function you can use to give yourself a little break (I had to stop for an hour at one point), but beyond that, there’s no down time. 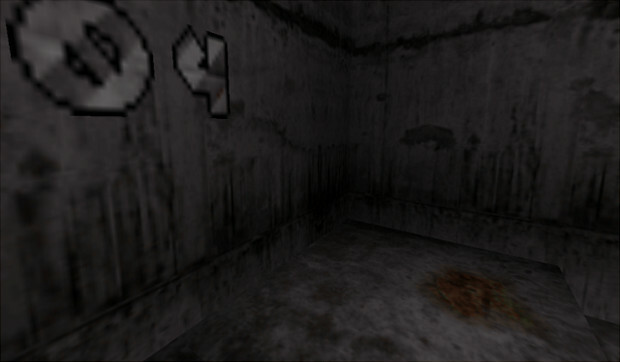 Most games have save rooms or little hidey holes where you’ve killed all of the enemies. Even most horror games have places that just feel safe so that the player can calm down. This game is just one long run, and beyond pausing, there’s no break from the terror. Even on pause, you don’t calm down all that much because you know the game is right where you left off, waiting for you. My chest was so tight from tension that I was actually in pain by the time I’d only gone down about twenty flights. The music didn’t help either. It plays in certain spots for whatever reason, and is so simplistic it’s hard to actually call it music. It plays more like a sustained note, changing only slightly after long periods have passed, and it absolutely messes with the player. It made my run all the harder because it was eerie, but also because as gamers, we tend to associate music with specific occurrences in games. When the music starts, it means something is about to happen. I sat on the stairs for a long time when that music started up, believe me. There are a few other minor occurrences that will jar you right off your keyboard and mouse, like snippets of voice and graphical effects. 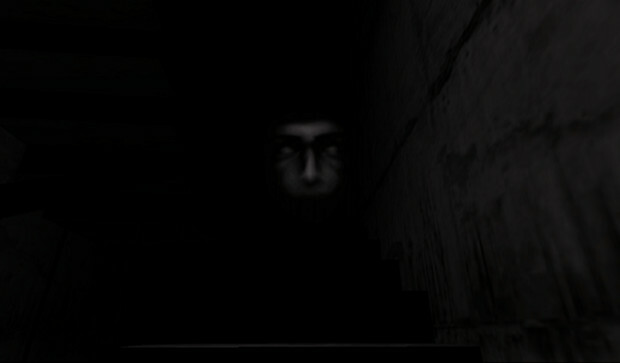 You’ll hear some really strange things while going down the stairs, all of which add to the unsettling atmosphere. Again, these all hint that something has changed in the game, and that something new is going to happen. It might or might not, though, due to the random appearance of the ghost, which only makes everything that much creepier. It’s been accused of being a single, drawn-out jump scare, but that’s all that decent horror is anyway. Lazy horror tends to have things jumping out all the time, afraid that its audience will lose interest if things aren’t happening every few minutes. The best horror games make you wait for something to appear. By the time the ghost decides to show up, you’ll be begging for it to end the tension. Good horror keeps you even more afraid when nothing is happening – your own imagination filling every step and corner with terrible things the game couldn’t hope to show. Every single step toward the ghost feels like that, as you never know what it’s going to do when it appears. You have no clue what triggers it or when it’s going to be staring you in the face. Will it pop out of thin air? Will you catch it just out of sight at the bottom of the stairs? Will you look behind you with an accidental flick of the mouse and find it glaring down at you? You don’t know, and so you load every single waking moment with grim possibility. Every step is taken with shaking hands because you only know that something horrible is going to happen during one of those steps. It’s going to happen, your only escape coming from shutting the game off and walking away. You won’t, though. Pride is a funny thing. I didn’t want to have to tell anyone that I’d played a horror game and had to walk away. That fact alone kept me at the keyboard more than anything else, and was all I was gripping to as I finished the game for the first time. I had to run down the stairs while screaming curses at the game, daring the ghost to come for me, but my pride wouldn’t let me give up. I don’t know if yours will, either. Now, if you haven’t played it and still want to, you might want to go download it, since it’s absolutely free. After playing through it a few times, I was disappointed to note that only the ghost’s appearance is random, and even then, it can only show up after floor 50. This might not seem too bad, but predictability is the nemesis of horror. The things that show up, as well as the audio cues that are supposed to freak you out, appear at very specific times. It turned what had been a long, arduous trip the first time into a predictable jog. I was literally ticking items off a list as I made my way down, not feeling any kind of concern until I got past a certain point. It took away the game’s power on repeat play-throughs, turning it into something you can really only experience once in your life. Also, when the ghost appears, you get frozen in place. Instead of stumbling upon the thing and having its presence hit you like a ton of bricks, you’re basically forced into a cut-scene of sorts. You’re locked in one spot until you manage to locate where the creature is around you, and then you’re told to run by some on-screen text. It was almost insulting, given how good the rest of the game was. Of course I’m going to run. Freezing the game in place let me get my bearings, situate myself, and have a few seconds to calm down and plot a course of action. It should have let me just run into the thing and find out myself what I should have done. It steals a lot of power from the random appearance when I can’t just stumble across the thing while blundering around, since I can just run around until the game’s system decides to tell me the creature is nearby. It was still scary enough to shock my hands from the keyboard two out of my three tries, but it should have scared me all three times. Running from the ghost is pretty terrifying, though, as I have no idea how far you have to go to get away, or if you even can. I managed to keep away from it for about ten seconds in one run, during which it caused weird things to appear to frighten me further. I got caught on some of the background, though, and it killed me. Watching it pick up speed while a jarring sound played through my headphones was deliciously frightening. Off the topic of the ghost, I really wish the pause system had been removed. It’s my own fault for using it, but the thing shouldn’t be in the game at all. It allows people to take breaks in a game that is built around ratcheting up tension as far as it can without offering any kind of release. The pause system allows sneaky cowards like me a way to steal some breathing room, thus making the game a whole lot more manageable. I don’t know how long it would have taken me to get through it without that function, but it would have been even scarier without it, I know that much. It does have a few problems for further play-throughs, but for a single horror experience, there is nothing that I’ve ever played that comes close to scaring me more than SCP-087. If you’re willing to go into it blind, its ability to terrify is astounding. It’s true horror without all the bells and whistles, a streamlined experience that fans shouldn’t miss out on. It’s short and it’s free, so you’re officially out of excuses not to try it. Except for the whole ‘causing chest pain from tension’ thing. 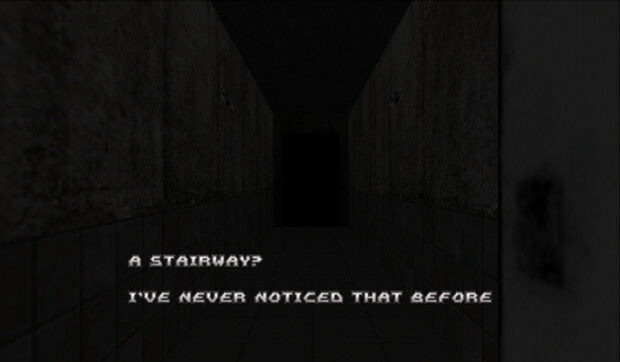 SCP-087 /The Stairwell is free to download on indiedb.